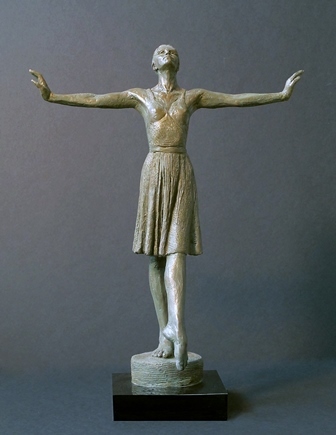 Marc Mellon is one of America's foremost representational sculptors and medalists, well known for his portrait busts, commemorative statues, and other works in bronze exploring the worlds of dance, sport, and family life. Schooled to pursue the sciences, Mellon left pre-medical studies for the study of history and philosophy, before discovering art as a vehicle to embrace all of his interests. From the start he enjoyed the challenge of conveying something of the inner life of his subjects, multi-faceted portrait busts, dance and sports sculptures in balance and motion, and strong figures of women that project a modern female sensuality. His works have been displayed from New York to Los Angeles to Tokyo and are in numerous corporate, private, and public collections worldwide. "I have been extremely fortunate," says the artist. " I've been present to see my works honor the achievements and vision of leaders in the worlds of dance, sport, business, philanthropy, medicine, religion, education, and civic affairs. This has been and continues to be, a humbling and fascinating journey." Individuals who have been recognized and honored with Mellon bronzes include Pope John Paul II, President George Bush, President Lee Teng-hui of Taiwan, athletes Michael Jordan, Mickey Mantle, Arthur Ashe, Roger Clemens, and Chris Evert, dance world legends Agnes de Mille and Ms. Cynthia Gregory, and business legends Armand Hammer, Steve Wynn, and Ted Turner. Mellon's love of the figure and interest in exploring core human values is evident in all his art. "My sculptures are meant to move and uplift the spirit," he says. "I'm interested in how we find meaning and fulfillment in this world, and my work, across the board, shows that interest." Mellon is President ex-officio of the Artists' Fellowship Inc., a foundation that assists professional fine artists and their families in times of emergency or bereavement. He is an active member of the National Arts Club, The Century Association, and The Salmagundi Club, all in Manhattan. Mellon also serves on the Steering Committee of the Portrait Society of America, and the Board of Advisers of the National Museum of American Illustration in Newport, RI. He has also served as sculpture juror for many national arts organizations, and has received awards from The National Sculpture Society, Allied Artists, the Hudson Valley Arts Association, The National Arts Club, and The Salmagundi Club. The artist has been casting in bronze for almost 40 years. He is married to fellow noted sculptor Babette Bloch. Marc and Babette have his-and-hers studios in Redding, CT, are each preparing for museum exhibitions in 2015 and 2016.